I saw the passion flower growing on a garden wall. 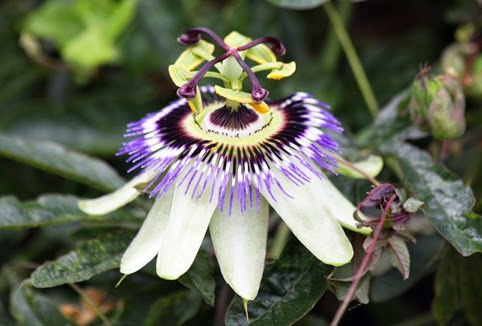 Passion flowers are climbing plants with exotic looking blooms that like sheltered, sunny spots. According to Cunningham's Encyclopaedia of Magical Herbs, the flowers are associated with Venus, which isn't surprising. However, the book also says: "Contrary to its name, the passion flower is placed in the house to calm problems and troubles, and to bring peace."